Single Board Computer running Debian with 3 high-speed USB ports and 6 VINT ports. 512 MiB SDRAM and 16 GB SD Card. 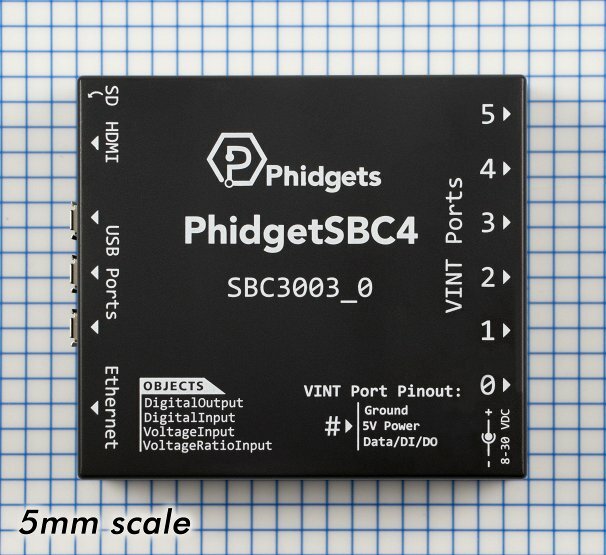 The Phidget SBC4 is a Single Board Computer with six integrated VINT ports. 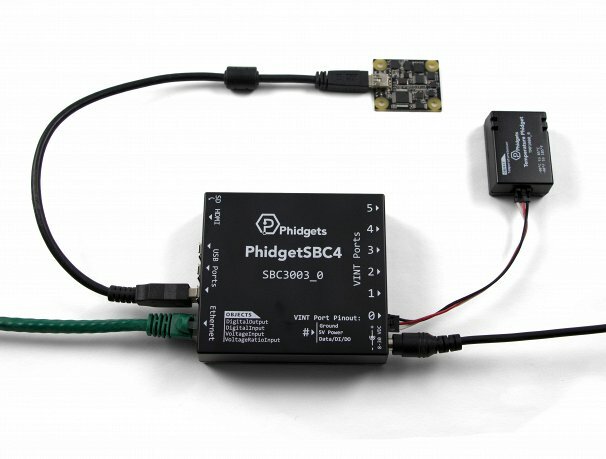 If you've ever wanted your Phidgets to be further away from your desktop computer than a USB cable can reach, an SBC is the solution. The SBC4 has it's own small computer which can make your USB Phidgets and VINT devices available over your home network. You can include the SBC4 in your network by plugging it in via ethernet cable, or by connecting a wifi adapter to one of its USB ports. The VINT SBC exposes an easy to use interface for setting up and running custom applications on-board. 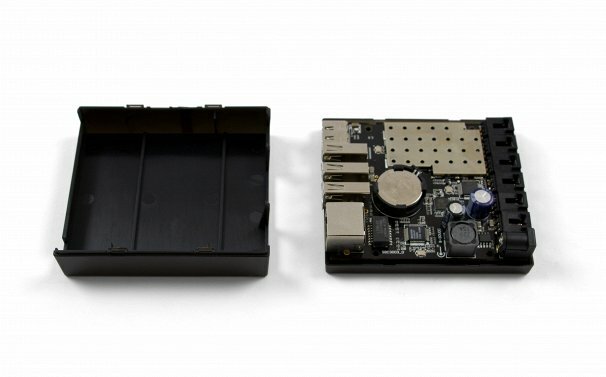 This allows the VINT SBC to operate autonomously, without the need for a graphical interface or a consistent remote connection. The SBC4 is an embedded computer that runs Debian GNU/Linux. We provide full shell access via a built-in SSH server, access to the full Debian package repository, and all of the standard command line tools expected on a modern Linux system. 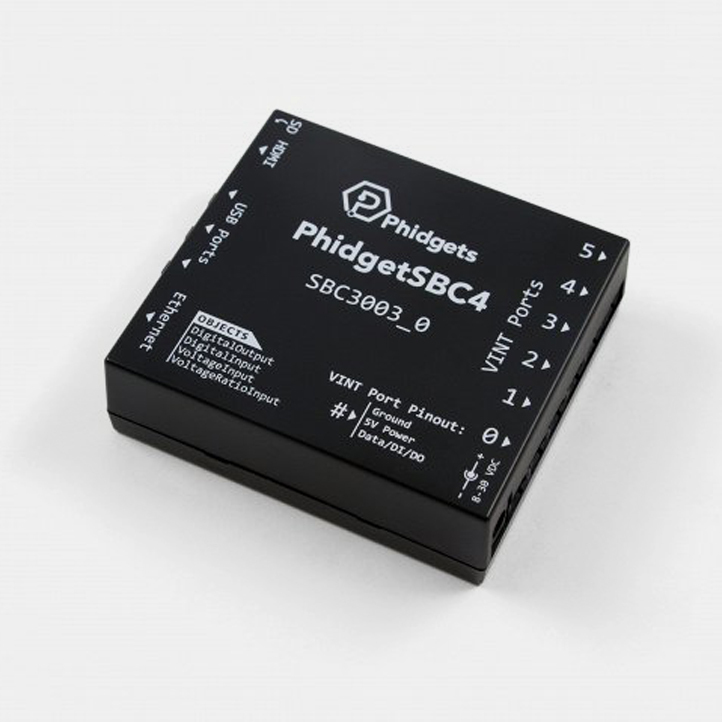 With the Phidget SBC4, you can connect six devices and make them available over the network. Each VINT port can perform one of four roles: Communicating with an intelligent VINT Device, reading a 0-5V Voltage or ratiometric sensor, acting as a digital output, or reading switches as a digital input. Each port has a power and ground pin, so you can also use the ports to gain access to the SBC's 5V supply. With its three high-speed USB ports, you can connect a variety of useful devices: USB Phidgets, webcams, keyboards, wifi adapters, and more! The SBC4 comes equipped with a MicroSD card port and 16GB card which gives you plenty of storage space and easy access to your progams and files. The card comes pre-loaded with the operating system and Phidgets drivers. The HDMI port on the SBC4 gives it the capability to connect to a monitor to display its Linux terminal. Combined with a USB keyboard, you can type commands or provide program input directly without the need for remoting in via SSH. **This processor supports dynamic frequency scaling, which lowers the clock speed to save power depending on processing load.